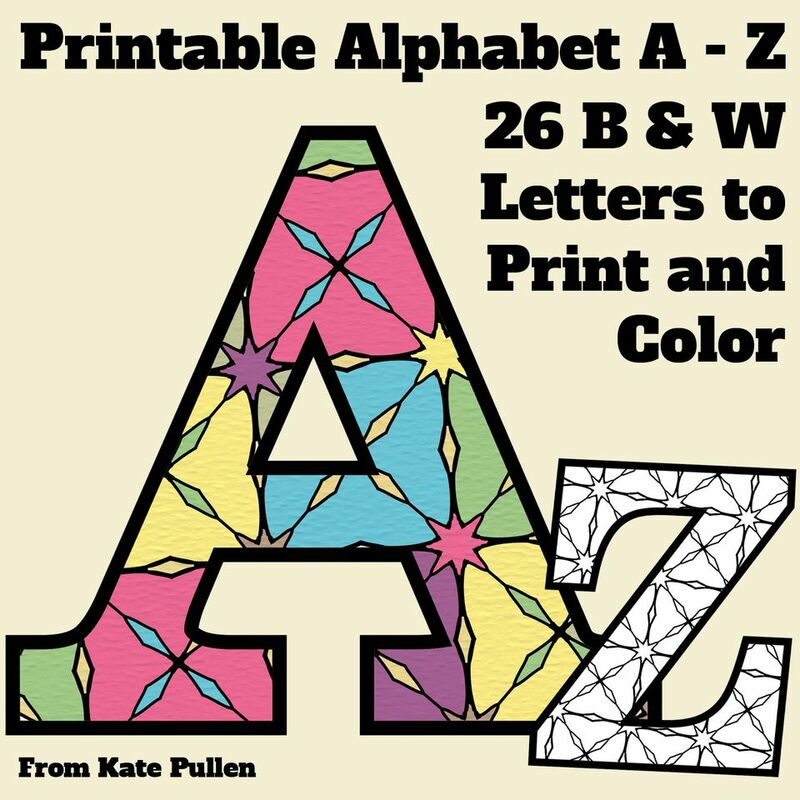 Here's a set of free printable alphabet letter images for you to download and print. You can download all the letters in a single file here or just download a letter individually below. The images are filled with a blackline pattern which means you can add your own color. These are large black and white letter images which you can color in the same way as you would digital stamps with marker pens, ink or other coloring methods. These free printable letters are saved in png files, with a transparent background so you can layer them together to spell out words without worrying about a 'white box' appearing around the letters. These letters are black and white outlines which you can color with marker pens or pencils. The blackline pattern has a slight 'stained glass' feel and will look colored in a variety of colorways. Add the letters to the front of handmade cards or spell out names (use your computer to make smaller size letters for cards). Print out larger letters to make name banners and bunting. If you don't have time to color the images print the letters onto colored paper and cut the letters from this before adhering the letters to a coordinating colored background to create a bold effect. Download this image of the letter A.
Download this image of the letter B.
Download this image of the letter C.
Download this image of the letter D.
Download this image of the letter E.
Download this image of the letter F.
Download this image of the letter G.
Download this image of the letter H.
Download this image of the letter I.
Download this image of the letter J.
Download this image of the letter K.
Download this image of the letter L.
Download this image of the letter M.
Download this image of the letter N.
Download this image of the letter O.
Download this image of the letter P.
Download this image of the letter Q.
Download this image of the letter R.
Download this image of the letter S.
Download this image of the letter T.
Download this image of the letter U.
Download this image of the letter V.
Download this image of the letter W.
Download this image of the letter X.
Download this image of the letter Y.
Download this image of the letter Z.